Precise planning and extensive preparations for Z Day ensured XIII Corps’ medical plan was executed almost without fault. Medical posts and evacuation routes were at all times capable of accommodating the large number of casualties. Although at periods particularly at walking wounded Collection Point ‘Mat Double’, Dive Copse and at Casualty Clearing Stations it did reach its capacity and there was some congestion. There is very little evidence to suggest this congestion resulted in unnecessary deaths, although we must presume it did in some cases. The total number of casualties sustained by XIII Corps was 6,100 officers and men killed and wounded. The lowest casualty rate of any attacking Corps on Z Day. In the 24-hour period after Zero Hour Dive Copse MDS was extremely busy, but not chaotic. A total of 106 officers and 1,150 other ranks were admitted, most of whom were serious stretcher cases. The figures included 3 French soldiers and 168 wounded German prisoners, including one German officer. Of this total, 97 officers and 727 Other Ranks were transferred to CCS’s until they were closed when at full capacity. This created overcrowding at the walking wounded collection point, ‘Mat Double,’ three miles east of Dive Copse. Major Dive received a message from XIII Corps HQ requesting he admit as many walking wounded as possible. This he did, taking nearly all of the cases. Luckily, the weather was warm and dry which allowed for those less seriously wounded to be laid in the open on a blanket. After a cup of tea and something to eat most slept through the night. Major Dive later estimated 2,000 wounded men spent the night of 1 – 2 July at Dive Copse, many of whom slept in the open. Over the following day patients were slowly transferred to CCS’s and base hospitals as space became available. Of the approximately 2,000 men who passed through the MDS at Dive Copse only 24 died of their wounds. Those men are buried nearby in Dive Copse Cemetery. During the infantry advance casualties were collected and treated in large numbers within minutes of Zero Hour. Advancing with the infantry, battalion and field ambulance medical officers and stretcher-bearers showed extreme gallantry in collecting wounded. Fighting was particularly fierce on 30th Division’s left where it joined the right of 18th Division. Here, the battle continued for hours as dogged enemy resistance slowed the advance. 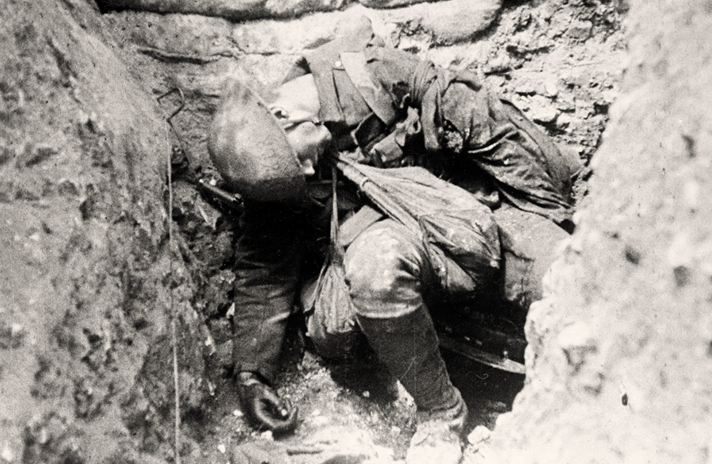 In German trenches men fought at close quarters against an enemy that refused to surrender. A German counter barrage fell around and behind the area. The ground was strewn with casualties requiring urgent medical assistance and evacuation; MOs and stretcher-bearers worked tirelessly. 55th Brigade, on the right of 18th Division, suffered exceptionally high casualties during their assault. On their Brigade frontage of 600-yards, 8th East Surreys, 7th Queen’s, 7th East Kents, and 7th Royal West Kents advanced, supported by their MOs and medical staff and bearer sections of 55th and 56th Field Ambulances. As field ambulance bearer-sections collected wounded, battalion MOs and their bearers advanced with their assaulting companies deep into German lines. The 8th East Surreys were engaged in intense fighting. Their Medical Officer, Capt. Edward Carwardine Gimson, (known as Jimmy to his friends) found himself in the middle of the carnage. For his actions on the day he was recommended for the Victoria Cross by Gen. Maxse. This was later downgraded to a DSO. After about two days I could hardly keep my eyes open, but things were a little easier and sometimes I could catch five minutes’ sleep on the trestles used to put the stretchers with the wounded on. I remember stepping outside once when things were getting a bit quieter for a breath of air, and a passing Padre stopped aghast and said ‘Good heavens man, you look like a butcher’ I suddenly realised what I must look like, my arms to the elbows, my face and hair, my trousers and even my boots were simply covered with blood. On 5 July GOC 30th Division ordered it to be conveyed to all ranks of RAMC of the Division his appreciation of the excellent work done by them during the recent advance. Removal of wounded from the field was carried on in the most expeditious manner and all possible care was taken for the treatment and general comfort of the wounded. By late afternoon on the first day the main fighting was over. Those who had been wounded were the lucky ones in most cases. 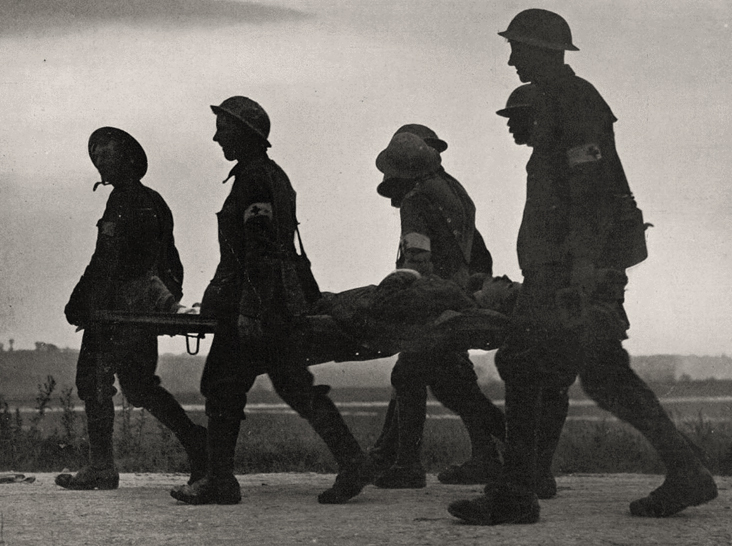 XIII Corps’ outright success enabled the stretcher-bearers to search the battlefield in what remained of the daylight, evacuating those unable to remove themselves. With the enemy pushed over Montauban Ridge, the only danger was the inaccurate searching artillery fire of the few remaining operational German batteries. The ground over which the battle had been fought was strewn with the cost of war. Where the remains of men lay thick and the discarded equipment of the wounded was scattered, the fighting had been severe. Between Talus Bois and the German Brick Point hundreds of bodies lay in all kinds of angles and postures. Whole sections had been killed in lines, where bursts of 7.92mm bullets had cut them down like a scythe. Three-hundred-yards west over 400 men of 55th Brigades vanguard battalions lay motionless in front of Breslau Trench. Yet in the ground between these two points in Train Valley, not a single British soldier lay dead. As the infantry had advanced deeper into the enemy trench system further evidence of slaughter could be found. Where the Germans resisted, at points like Train Alley, Back Trench and The Loop, fighting had usually been at close quarters, brutal and a fight to the death. The shattered trenches were full of opposing foes, laying intermingled, bloodied bodies torn open with horrific wounds caused by bomb blast and splinters, high velocity bullets fired at short range and bayonets. The 18th Division had come off worse, their total dead amounted to 45 officers and 865 ORs, 30th Division totalled 26 officers and 740 ORs. Although the exact figure will probably never be known. A comparison of the war diaries, CWGC and official records compiled for ‘Soldiers Died in the Great’ War all calculate different tallies. Understandably, at the time many men were initially listed as missing, 30 Division posted the names of 382 missing, 18th Division 252. Many of these were wounded who had filtered back through the evacuation chain, their units being notified at some point in the future. Some, at least twelve, in 30th Division were taken prisoner during the German counter attack. Others were never seen again, either buried by the spoil overburden from an explosion or caught close to the seat of a high explosive detonation, evaporating them into a cloud of pink mist. Many wounded died during the following days or even over subsequent weeks and months. A search of the rear area cemeteries along the Corps’ medical evacuation route found 82 men of 30th Divisions infantry who had died of wounds between 1 – 4 July. The figures for 18th Division are similar at 95. This equates to roughly 10% of all deaths for both divisions. It is difficult to estimate the number of Germans killed as XIII Corps attacked over the boundary between two German regiments, 6th Bav RIR and RIR 109, with a third regiment, IR 62, in support. To complicate matters further, the German regimental boundaries did not match the British, so 18th Division attacked elements of six kompanies of RIR 109, two of 6 Bav RIR and a kompanie of IR 62. The 30th Division assaulted four kompanies of 6th Bav RIR and three kompanies IR 62. A rough estimation can be calculated by looking at the German casualty figures for the kompanies, from all three regiments, directly engaged and totalling them. The German fighting strength of the eight infantry kompanies, attached machine-gun sections and a platoon of IR23 is estimated at between 1,800 – 2,000 men (dependant on Kompanie strengths at the time minus casualties sustained during the preliminary bombardment). A rough calculation puts German deaths at between 775 – 860 and prisoners captured 845 – 940, many of whom were wounded. It is very unlikely the exact figures will ever be known, Fourth Army intelligence summary of 2 July claimed that the two German Regiments, RIR 109 and 6th Bav RIR, may be regarded as little fighting value due to their heavy losses. Then the worst had to come, burying the dead. Men I had known all the time I was in the army and some I had known before I joined up. It was very hot and they had turned black; we buried them in shell holes, taking their identity discs off them. One man had some box wood and made little crosses and put their names and numbers on them with a blue pencil. I buried some of my mates and did not know till I saw their names on the crosses. Men were buried close to or on the spot where they were discovered. Any hole, shell or trench was utilised to make the job easier, there was no time nor manpower to carry dead off the battlefield to carefully prepared cemeteries. 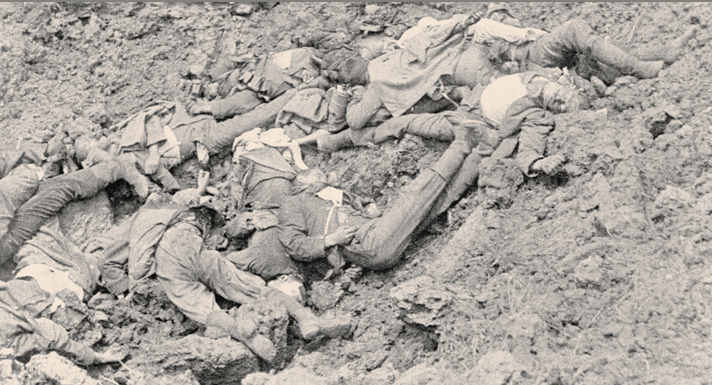 German remains were dragged and rolled unceremoniously into holes, their bodies resembling a heap of tangled rag dolls. The Germans were covered over with a thin layer of soil, very few positions being marked or the details being recorded. At this stage of the war battalions were responsible for burying their own men, they took more care, laying the remains in as dignified a way as the space and rigor mortis allowed. The names of dead were scribbled down in note books, locations noted and positions marked with temporary markers, such as weapons, helmets, bayonets or a cross fashioned from debris. They were often in small groups, men who had fallen together. As the fighting battalions withdrew to the rear area for rest, other units were employed on the unpleasant work. It was over a week before the battlefields were fully cleared of corpses. The area was soon covered with shell-hole burials, small plots and isolated graves. Some larger plots were named; Montauban Road Cemetery, a mine crater that had previously been on the western edge of Carnoy Craters. It was now the final resting place for twenty-five men of the 7th Queens and 7th Buffs. Two cemeteries were close to the northern tip of Talus Bois; Vernon Street, holding over 110 remains and Squeak Forward Position, with 19 men from the 21st Brigade. Vernon Street was the old British support trench, no longer in use and so converted to a deep mass grave. Squeak Forward Position was a large shell crater. There were many other smaller ‘nameless’ plots; one in the old German second trench, Breslau Support, contained the remains of 16 East Surreys, Queens and Buffs. Another between Breslau Trench and Breslau Support held three officers and 7 ORs of the Queens. The 8th Norfolks had two small burial sites, one in Bund Trench and another in Loop Trench, as did the Bedfords in The Castle and Mine Alley. At least thirty small battlefield burial sites have been identified via CWGC records that held or still hold XIII Corps men. As the war progressed, some of the sites remained marked whilst others lost their markers or had never been marked in the first place. Formed in February 1916 the Directorate of Graves Registration and Enquires (DGRE) endeavoured to record as many of the burials or locations of men’s remains as possible. It was obvious to care for graves and to commemorate the dead in a practical way, smaller cemeteries, burial sites and isolated graves would have to be concentrated into larger cemeteries. Organised exhumation work began in earnest during early spring 1919. 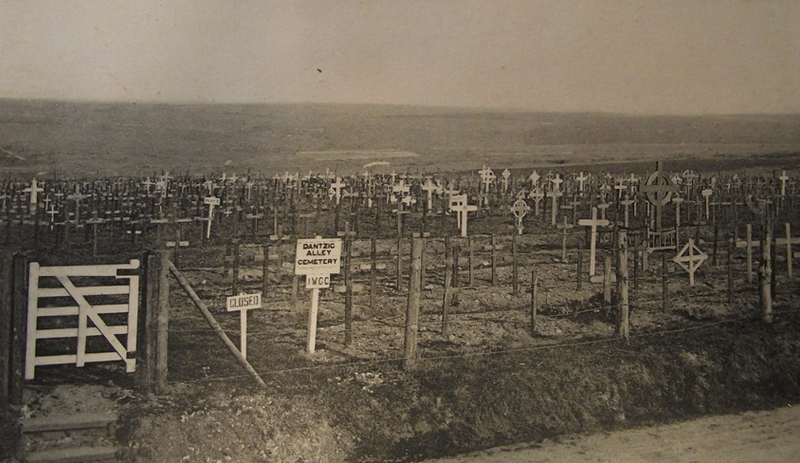 Dantzig Alley Cemetery on the Mametz – Montauban road, which already held 183 burials, was chosen as the primary concentration cemetery for the sector. The task undertaken was immense, of the original 1,676 dead of XIII Corps killed between 1 – 4 July 1916 only 260 were already buried in cemeteries selected to remain. This meant 1,416 remains were to be exhumed and concentrated, if they could be found. It became obvious that not all burial locations were marked. To assist the exhumation, teams’ maps were issued with grid lines as per the wartime trench maps. The lines divided the map into 500-yard square boxes. In each box a figure was written in blue china-graph pencil, that figure represented where bodies were registered as buried according to DGRE records. 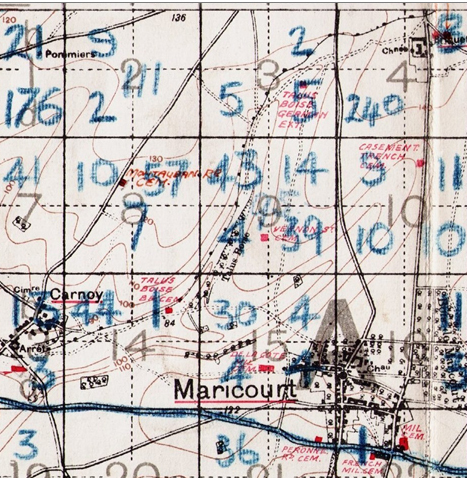 The maps later became known as ‘body density maps’ two covering the XIII Corps sector are shown to the right. Between spring 1919 and summer 1921 133 Labour Company exhumed and concentrated 270 remains of 18th and 30th Division soldiers, as well as an unknown number of unidentified remains to Dantzig Alley Cemetery. During 1921 the Labour Companies returned to the UK and the IWGC took the lead, with the Montauban sector coming under Area No.5 Peronne. The withdrawal of the Army diminished the available manpower and searches for unmarked graves continued, although they were reduced. Priority was instead focussed on the concentration and construction of cemeteries. During 1924 – 1925 Maricourt Military Cemetery, located on the south-eastern aspect of the village, was closed with 260 remains, mostly pre-Z Day XIII Corps casualties were reinterned in Cerisy Gailly Cemetery 12-miles away. As time went on, the IWGC relied more and more upon local reporting as ground was levelled, drainage dug, and roads created. Remains were being found by chance, usually by those working the fields or on reconstruction work. During December 1925 the remains of five British soldiers were discovered at Montauban on ground just north of the main road running east – west through the village. Several remains had Manchester Regiment shoulder titles, 2nd City, and another an identity disc. The disc belonged to Pte. Joseph Peat, 17th Manchesters. He had been reported killed 1 July 1916, aged 23. Above: Dantzig Alley Cemetery circa early 1920’s. During the late 1920’s and early 1930’s several remains were discovered by locals, however none were identified. Then during April 1933 a large grave was exposed by chance in the fields that were part of the old German front line, Breslau Trench, 250-yards east of the Carnoy – Montauban road. Twenty-two remains were discovered, of which sixteen were identified. The men were all 7th Queen’s, the oldest was 42-year-old Sergt. Henry Hill from Penge Kent, who was identified by his watch, whistle and rank. Pte. William John Pullen a former chauffeur from Beare Green, Surrey, was identified by the contents of his wallet. L/Cpl. Ernest John Pearce was identified by his regimental number impressed in his metal spoon. Pte. Charles Harold Swainland had only one surviving close relative, his sister Florence, she chose an epitaph for Charles’ grave stone, ‘For ever in my thoughts sister Flo.’ All 26 men are buried together in Combles Communal Cemetery Plot III, Row E, Graves 5 – 26. One hundred years on, many Z Day XIII Corps men are still missing. Of the 1,676 casualties 1,021 (61%) are commemorated on The Thiepval Memorial. There is no doubt that many rest in graves of an unknown soldier, of these most will lay in Dantzig Alley Cemetery and a small fraction in other local cemeteries. There are 518 men in unidentified graves in Dantzig Alley, ninety-percent are soldiers from XIII and XV Corps killed between 1 - 4 July. A good estimate would suggest the remains of 500+ XIII Corps men still lay undiscovered in the fields between Mametz-Montauban-Maricourt-Carnoy. We know 57 men are still unaccounted for from Vernon Street, research also suggests possibly up to 80 men of the 16th and 17th Manchesters are buried in one or a few mass graves north of Montauban possibly in a section of Montauban Alley. Other battalions that suffered heavy casualties but have very few men buried are 18th King’s, 8th East Surreys, 8th Norfolks, 6th Royal Berkshires and 7th Queen’s. It is likely that nature, the constant working of the fields and the current policy to build on land within villages that has been left undisturbed for one-hundred-years will result in more of the missing being found.